Which Chain Grade Should I Use for Towing? Chain is a highly-versatile and useful tool that has been around for thousands of years. Its many applications include lifting, tension, tie downs, and towing. Throughout the years of chain manufacturing, general standards of practice, safety, and inspection have improved drastically. In the past, any type of chain was used for any application, without consideration of these factors. So now, the American Society of Testing & Materials (ASTM), American Society of Mechanical Engineers (ASME), and the Occupational Safety & Health Administration (OSHA) all regulate the manufacturing, testing, use, inspection, and repair of chain. Today, chain is stronger, tougher, and more reliable, and comes in various grades for different applications. 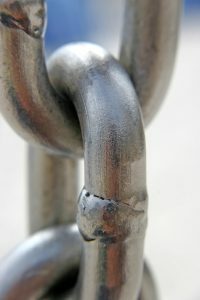 When it comes to using chain for towing, it is vital to use the proper grade. If you are looking for a proper towing chain, continue reading to learn the different grades and their recommended towing functions. As you begin to look for chains, you will notice their grades in the form of a capital letter followed by a number, such as G30. The grade is the maximum breaking strength of the chain, and measured in newtons per millimeter squared (N/mm2). So a chain that is graded as a G30 means that the maximum stress on the chain at its ultimate strength is 300 newtons per millimeter squared. As for towing, the most common chain grades are G43 and G70, but other grades are also necessary if overhead lifting or heavy tie-downs are needed. Look below for details of towing chain grades. This is a common chain grade that is suitable for towing, meeting all ASTM and ASME specifications. It most common towing applications include heavy-duty towing, logging, and container securement. But this chain is not intended for overhead lifting. You would need a stronger grade for this type of application. This is another common chain grade used for towing applications. As a heat-treated carbon steel chain with no additional alloys added in, it is higher in strength compared to the G43. It has a gold chrome finish that protects it from premature corrosion. Its common towing uses include logging, load securement, trucking, lashing, and even trawling. Just like the G43, it is not intended for overhead lifting. Call Zore’s Towing at 317-247-8484 if you need prompt towing services in Indianapolis or Central Indiana. We are certified tow truck operators with an extensive fleet of trucks and a larger inventory of innovative equipment for towing and recovery applications. We offer a wide range of towing services, from light duty tows to heavy equipment transport, and much more. Call 317-247-8484 to request a free estimate for Indianapolis tow truck service, today. This entry was posted in Towing and tagged chain grades, Grades of Chain, Indianapolis Tow Truck Service, safety chains towing, towing chains. Bookmark the permalink.